My children have morphed into Princesses-Cinderella, and Sleeping Beauty. We also have a BLUE Power Ranger. “I” have decided to morph myself into SUPER MOM!!! AGAIN! Who else is with me? Why do we all have this pedistal , that we feel we must stay up on, when we are crafty? I hope I’m not alone in this venture. MY mom always made holidays the BEST! All our traditions, and just every little thing was always perfect. I remember EVERY SINGLE ONE! Some of these traditions I pass on in my family-such as buying each person, in our home, a special ornament every year. I love that one! I guess because of that, I put myself on this mission to do the same, while trying NOT to kill myself doing it in the process. I think I feel my kids will base their entire childhood on these “events” in life. Maybe because they impacted mine. He was right! I always made all these cute things for Alexa’s class parties/holidays. BUT I only had ONE kid in school. Now I have 3!!! That means LOTS more work. Amber was set cause we made sugar cookies, and picked out “special” candy for the kids to decorate the cookies. So, I got the kids off to school, ran to Michaels, then to Target for candy. WHIPPED up things for Noah’s class, and Alexa’s. WHEW! Super Mom to the rescue! 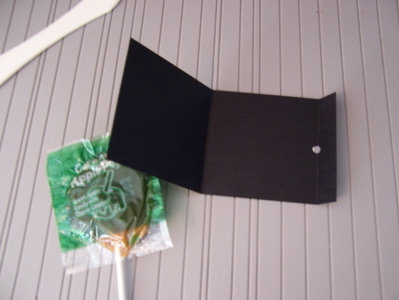 When I was done, I showed Noah his little “Franken Folder” lollipop holder, and he was SO EXCITED! He asked if we could bring them to school that minute! He wanted to show his teacher, and make sure it didn’t get ruined on the bus! He thought all the kids would like seeing them as they come into class. He better marry a crafty woman! LOL! I guess this is why we do what we do right? As mother’s we will do just about anything for our children. Heck, I would give my LIFE for my children, the least I could do was wrap some lollipops right? I also wanted him to know, I love him every bit, as much as his sister. I think that was a little message he was conveying-Like “Hey!!! I need love too!” When you have a sick child that requires so much, I think its easy to not always remember its the littlest things that help the other ones know they are just as important. On the day to day, how is a healthy kid suppose to compete with one puking in a bucket? So I felt good! Mission accomplished! So here is the DIRECTIONS for the Franken Folders (as I like to call them). All they are is a lollipop wrapper. I didn’t invent the idea. I didn’t check out HOW to make one-I just came up with my own fast way. I used apple lollipops-wrapped with caramel. YUMMY!!! Measured the wrapper 2 1/5 X 2 1/5. Cut cardstock 2 1/2 X 5 1/2. You get 6 per sheet of 8 1/2 X 11 cardstock. Used myScor-Pal, and scored at 2 1/2 and 5 inches. Punched a hole with my Crop-a-dile in the middle of the score line, at the 1/2 inch mark. Creased the score lines, and applied adhesive to the 1/2 inch flap. Stuck the stick through the hole, and attached that adhesive! These went fairly quick. As, they were a breeze to make! The coloring took a little bit-but I did ONE color at a time, and went form image to image. Assembly line! I resisted the urge to further embellish!! Reminding my self that its all getting tossed-so don’t go that one step extra. 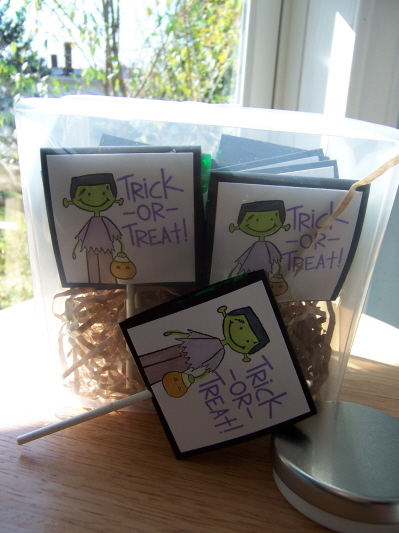 Like glitter on the pumpkin, adding a layer of cardstock behind the main image, ribbon……………..you get the idea. SIMPLE!!! The bags for Alexa were obviously super fast! I made 25 in 10 minutes. 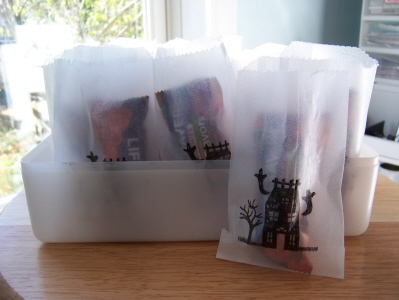 Just stamp the house on the glassine bags with Brilliance ink-then fill!! Filling took the longest- LOL! I think it was a great quick touch for something handmade. SOLID images! Gotta LOVE them! So I would LOVE to hear what your kids are for Halloween, or what your all time favorite costume was a kid. I have some SUPER cool samples to share tomorrow with the NEW! MFT Stamps :D. Wait till you see what I did. 21 Responses for "Being SUPER mom-Hauntingly easy!" Furthere down in the post I reported that I used Brilliance ink 😀 I only use Graphite Black on all my cards 😀 Penguin sounds cute!!! love the treet’s you send for your kids school !!! Guess what ??? I’m a super mom also for Halloween !!! Or for the hole year ..
Here’s to all the super mom’s !!! Happy Halloween and enjoy being the super heroe in your kids life !!! P:S love your blog !!! Well, My kids are going to be 3 soon…they are twins…one boy and one girl. But of course I made something for the teachers at their once a week class I take them too. I can’t resist. I go overboard…I mean WAAAAYYYYY overboard. I can’t help it….it is a sickness. I love Halloween and I always have to come up with wacky costumes. When they were 9 months old….they were a shark and a lobster..last year they were Princess Leia and Yoda…this year….Elvis and Priscilla…Yes…you read that right!! I think it is going to be SOOOO funny. I loved your story about Noah…how cute is that??? Great job from one SUPER MOM to another!!!! What a good job you did being super mom!! I know how you feel though! It is a little easier for me though since I am my kids’ teacher! LOL We are like that with family functions though. Cupcakes and cookies decorated to the max! The kids have so much fun doing though! They came out super-cute, Lauren! Love both treats! I’ll give ya a full report on the school party. Hope all goes well for Alexa today! Oh my gosh! You are my clone! Although… this year, I’m totally slacking. I had the supplies, the idea… but I never got it finished. I’ve been bummed all morning… wondering if I should try to make them and bring them into school.. etc. — but, now I’m just telling myself to just step it up for Christmas instead. I am SO thankful that my son didn’t ask me to make something, or I’m sure I would have been up half the night making sure it was ready. My mom always made things extra special and I “blame” her for my insanity. Last year, for Eli’s snack day, I couldn’t just buy prepackaged food like everyone else. Oh no. Instead, we spent hours baking cupcakes, “drawing” school buses with icing… etc. I think my fave costume as a kid was when I was an M & M! Loved that! I’ve always wanted to go as Wilma and Fred with my husband but I can’t get him to wear the dress! ROFL! Right now I should be in the 1st grade class with my daughter naomi for her halloween party but Noah had an attack of croup (or asthma??) in the middle of the night and couldn’t breathe, he scared the hell out of me (appropriate for halloween) so I’m keeping him home today and had to skip the party 🙁 I’m so sad! Maybe next year I’ll dress him up if he wants to!…. I like the idea of the glassine bags, super fast and cool, might still that one for next year! I don’t have kids, but I do have a niece that I like to spoil. 🙂 We just made bag toppers with pumpkin orange paper and the booglie eyes set and filled the bags with candy and a few little party favors. She was very excited to take them to her 1st grade class! You are super Mom! Your kids are lucky that you have special traditions for them and I know that traditions are sometimes a burden. Your kids will remember you for all the special things that you do! My Mom was a career woman all her life and now I know what that includes – I still wish she had spent more time on some of the traditions around the holidays. But I – as super woman with not kids – have created traditions and share them with my extended family – most of the holiday events are now at my place! Enjoy your burdens – they will grow up and continue your traditions and create some of their own! You did a GREAT job, and I’m sure Noah was excited!!! You ARE Super Mom, I don’t know when you have time to breathe!!! Have a wonderful Halloween with your precious kids! You really are amazing! Way to go SUPER MOM! It’s so nice to read how special this made both Noah and you feel. Family traditions do have a way of becoming wonderful memories. Happy Halloween! you’re a good mom and it makes me smile whenever you do something special for your kids! Every time I hear you mention that Scor-Pal was used in your craft and maybe sped things up a little I know why Scor-Pal was invented. You know it has been a God driven project since the beginning and I do wonder why he gave me the idea but I am so glad he did. It helps others..I couldn’t ask for more…what a great joy that is!! Thank you from the bottom of my heart for your special card and photo inside. This will be hung on our Christmas each and every year and I know in my heart that one day I will get to meet you and your family and give you a special hug in person!!!! Chi Flat Iron and Hot Pink GHD.we are a approved GHD internet retailer and only sell genuine hair straighteners.